Staying positive is one of the best things you can do for your health! Stress increases your risk of every illness from headaches and ulcers to high blood pressure and cancer. Of course it’s easy to say just be happy but sometimes it can be a challenge so here are some happiness tips that can help you stay in the happy lane! 1. Don’t Sweat the Small Stuff. When you have a bump in the road, which often happens to all of us, take a pause and ask yourself, how much will this matter in 5years? Often the answer is that it won’t matter much at all so don’t waste time sweating or stressing over it. Keep it moving and spend your energy on the things that matter. 2. Choose Gratitude. Try to always stay in a state of gratitude because being grateful for life and all of your life experiences is the door to happiness. Choosing gratitude is a great way to turn your frown upside down. If you are experiencing a challenging day or a challenging moment, take a moment to write down or think of 5 things that you are grateful for. As you move through those 5 things, take a moment to visualize them and each one will help you return to joy and happiness. 3. Let a painful moment from the past stay in the past. Many of us have experienced painful moments in life and every time you talk about this painful experience you are actually living through those emotions again and that definitely does not feel good. Choose to let the past stay in the past don’t let bad experiences from the past steal your present joy. Stay in the present moment and enjoy the now! 4. Start the day with a workout, positive thought and/or meditation. When you wake up each day before you begin all of your daily chores, the never ending to do list and responding to all of the requests from work and family, take a moment for yourself. Starting your day with a workout will give you a boost of endorphins (happy hormones) which will help you start the day feeling positive about yourself and your day ahead. The workout options are endless: 10-20min power walk, jog, yoga, hike, kickboxing class, cycling class, online/internet club workout. Choosing a positive thought or reading daily positive quotes are also great to set your day in a positive direction. Meditation, focusing on your positive intentions for the day and visualizing yourself putting those intentions into action are also a very powerful ways to start your day. 5. Fuel your body with a healthy balanced meal plan. Most of us have all experienced “hangry” that moment when you feel like you are going to snap on someone if you don’t get some food in your system. You get angry or irritable because you have low blood sugar. Well it doesn’t just happen to children, adults who are not following a healthy meal plan can and do experience hangry! Here’s an example of a balanced day of healthy eating. 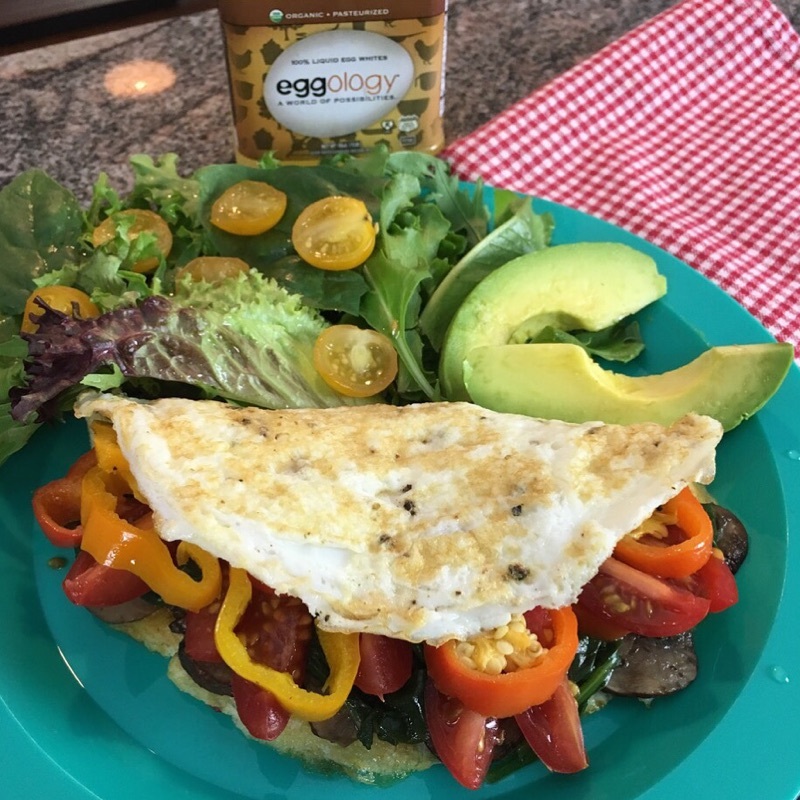 Here is the recipe for our Organic Eggology Veggie Egg White Omelet with a Side Salad. It is an excellent balanced meal with healthy protein to help you feel satisfied and full. Colorful vegetables & avocado packed with nutrients and healthy fat. Simple and easy to prepare, this is a great meal to have any time of day, Breakfast, Lunch or Dinner! For daily positive motivation, over 300+ workouts and challenges and 150+ healthy recipes, daily and weekly healthy meal plans join or login to our club www.TheHollywoodTrainerClub.com and leave a message on our Community Wall! We can’t wait to meet you!